A groundbreaking look at the connection between germs and mental illness and how we can protect ourselves. Is it possible to catch autism or OCD the same way we catch the flu? Can a child's contact with cat litter lead to schizophrenia? 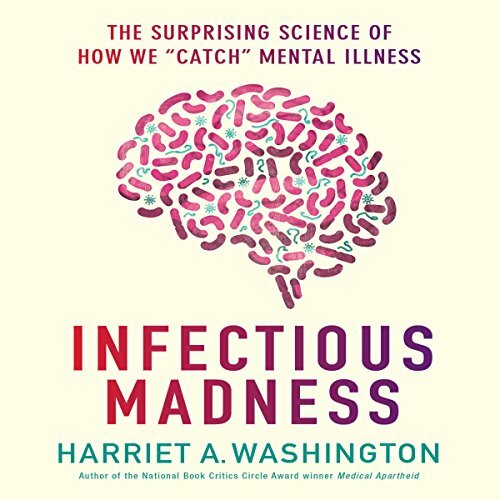 In her eye-opening new audiobook, National Book Critics Circle Award-winning author Harriet Washington reveals that we can in fact "catch" mental illness. In Infectious Madness, Washington presents the new germ theory, which posits not only that many instances of Alzheimer's, OCD, and schizophrenia are caused by viruses, prions, and bacteria but also that with antibiotics, vaccinations, and other strategies, these cases can be easily prevented or treated. Packed with cutting-edge research and tantalizing mysteries, Infectious Madness is rich in science, characters, and practical advice on how to protect yourself and your children from exposure to infectious threats that could sabotage your mental and physical health. I thought Medical Apartheid was just fantastic, so I was excited to read something new by Washington. This is a strange, strange book though, that plays into our contemporary desire to attribute mental illness to wholly biomedical causes and sidestep the social and cultural contexts in which they emerge. It does not ask the hard questions about mental illness that sociologists and historians of medicine have been decades, but instead treats many disease categories (like Schizophrenia) as biologically distinct and discrete. It raises interesting questions for sure, but not of the sort I expected from this author. Very well done and informative. This book is inspiring and reminds health care professionals of our duty. the book while cleaning the garage. we don't have time. spend on now these procedures now. Harriet Washington does it again with a scientific read, that is Informative, thought provoking and wonderful.